Decreasing fuel consumption and emissions in automobiles continues to be an active research problem. A promising technology is powertrain hybridization. Study in this area usually focuses on the development of optimal power management control methods. The equivalent consumption minimization strategy (ECMS) is a widely used real-time control method used for determining the optimal trajectory of the power split between the engine and motor. Reports also cover applying ECMS to find an optimal gear changing strategy, but results are not always satisfactory in fuel economy and drivability. One possible reason for this is that gearbox dynamics are slow, but ECMS is based on instant optimization and neglects this time delay. This paper proposes a simple prediction strategy for improving ECMS performance used with gear changing control. The proposed controller improves fuel efficiency and drivability without the need of adding extra sensors to the automobile. The proposed method’s simplicity makes it suitable for implementation. M. Khodabakhshian, L. Feng, and J. Wikander, “One-Step Prediction for Improving Gear Changing Control of HEVs,” J. Robot. Mechatron., Vol.26, No.6, pp. 799-808, 2014. J. Gessat, “Electrically Powered Hydraulic Steering Systems for Light Commercial Vehicles,” in SAE Technical Paper 2007-01-4197, 2007. A. Sciarretta and L. Guzzella, “Control of hybrid electric vehicles,” IEEE Control Syst. Mag., Vol.27, No.2, pp. 60-70, Apr. 2007. V. Marano, P. Tulpule, S. Stockar, S. Onori, and G. Rizzoni, “Comparative study of different control strategies for Plug-In Hybrid Electric Vehicles,” SAE Tech. Pap. 2009-24-0071, 2009. J. W. Grizzle, “Power management strategy for a parallel hybrid electric truck,” IEEE Trans. Control Syst. Technol., Vol.11, No.6, pp. 839-849, Nov. 2003. C. Lin, H. Pengl, and J.W. Grizzle, “A Stochastic Control Strategy for Hybrid Electric Vehicles,” in American Control Conf., pp. 4710-4715, 2004. R. Wang and S. M. Lukic, “Dynamic programming technique in hybrid electric vehicle optimization,” 2012 IEEE Int. Electr. Veh. Conf., pp. 1-8, Mar. 2012. P. Pisu and G. Rizzoni, “A Supervisory Control Strategy for Series Hybrid Electric Vehicles with Two Energy Storage Systems,” 2005 IEEE Veh. Power Propuls. Conf., pp. 65-72, 2005. Y. He, M. Chowdhury, P. Pisu, and Y. Ma, “An energy optimization strategy for power-split drivetrain plug-in hybrid electric vehicles,” Transp. Res. Part C Emerg. Technol., Vol.22, pp. 29-41, Jun. 2012. E. Hellström, J. Åslund, and L. Nielsen, “Management of Kinetic and Electric Energy in Heavy Trucks,” SAE Tech. Pap. 2010-01-1314, 2010. D. F. Opila, D. Aswani, R. McGee, J. A. Cook, and J. W. Grizzle, “Incorporating drivability metrics into optimal energy management strategies for Hybrid Vehicles,” 2008 47th IEEE Conf. Decis. Control, pp. 4382-4389, 2008. X. Wei, “Modeling and Control of a Hybrid Electric Drivetrain for Optimum Fuel Economy, Performance and Driveability,” Ph.D. diss., The Ohio State University, 2004. P. Pisu, K. Koprubasi, and G. Rizzoni, “Energy Management and Drivability Control Problems for Hybrid Electric Vehicles,” in Proc. of the 44th IEEE Conf. on Decision and Control, pp. 1824-1830, 2005. P. Poramapojana and B. Chen, “Minimizing HEV fuel consumption using model predictive control,” Proc. 2012 IEEE/ASME 8th IEEE/ASME Int. Conf. Mechatron. Embed. Syst. Appl., pp. 148-153, Jul. 2012. V. Ngo, T. Hofman, M. Steinbuch, and A. Serrarens, “Predictive gear shift control for a parallel Hybrid Electric Vehicle,” 2011 IEEE Veh. Power Propuls. Conf., pp. 1-6, Sep. 2011. T. O. Deppen, S. Member, A. G. Alleyne, S.Member, and J.Meyer, “A Model Predictive Control Approach for a Parallel Hydraulic Hybrid Powertrain,” in American Control Conf. (ACC), pp. 2713-2718, 2011. S. Boksuwan, T. Benjanarasuth, C. Kanamori, and H. Aoyama, “Robust Hybrid Control for Two-Dimensional Handheld Micromanipulator,” J. Robot. Mechatronics, Vol.26, No.3, pp. 331-340, 2014. Y. Kuroda, M. Suzuki, T. Saitoh, and E. Terada, “Self-Supervised Online Long-Range Road Estimation in Complicated Urban Environments,” J. Robot. Mechatronics, Vol.24, No.1, 2012. X. Wei and G. Rizzoni, “Objective Metrics of Fuel Economy, Performance and Driveability ��� A Review,” in SAE Technical Paper 2004-01-1338, 2004. 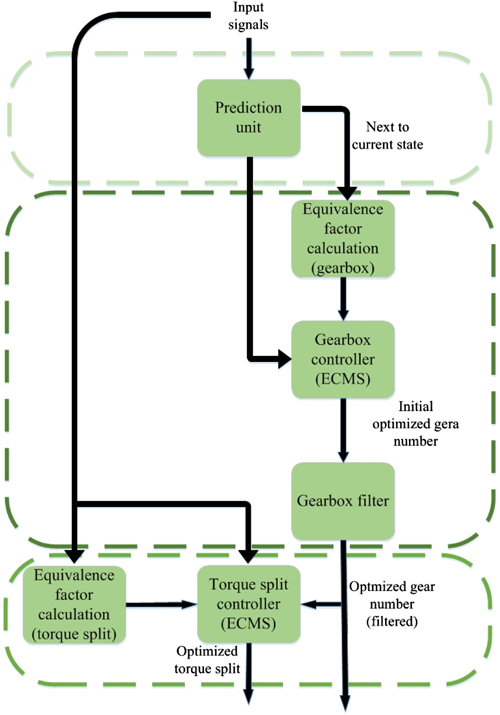 M. Khodabakhshian, L. Feng, and J. Wikander, “Optimization of Gear Shifting and Torque Split for Improved Fuel Efficiency and Drivability of HEVs,” in SAE Technical Paper 2013-01-1461, 2013. A. Sciarretta, L. Guzzella, and M. Back, “real-time optimal control strategy for parallel hybrid vehicles with on-board estimation of control parameters,” in IFAC Symp. Advances Automotive Control, pp. 502-507, 2004. G. Paganelli, “General supervisory control policy for the energy optimization of charge-sustaining hybrid electric vehicles,” JSAE Rev., Vol.22, No.4, pp. 511-518, Oct. 2001. C. Musardo, G. Rizzoni, Y. Guezennec, and B. Staccia, “A-ECMS: An Adaptive Algorithm for Hybrid Electric Vehicle Energy Management,” Eur. J. Control, Vol.11, No.4-5, pp. 509-524, Oct. 2005. M. Khodabakhshian, L. Feng, and J. Wikander, “Improving fuel economy and robustness of an improved ECMS method,” in 2013 10th IEEE Int. Conf. on Control and Automation (ICCA), pp. 598-603, 2013. L. Johannesson, S. Pettersson, and B. Egardt, “Predictive energy management of a 4QT series-parallel hybrid electric bus,” Control Eng. Pract., Vol.17, No.12, pp. 1440-1453, Dec. 2009. D. P. Bertsekas, “Dynamic Programming and Optimal Control,” Athena Scientific, 2012. R. Schutte, “Development of an energy minimization controller as a benchmark for Hybrid Electric Vehicles,” Master thesis, University of Groningen, 2013. C. Fauvel, V. Napal, and A. Rousseau, “Medium and Heavy Duty Hybrid Electric Vehicle Sizing to Maximize Fuel Consumption Displacement on RealWorld Drive Cycles,” in EVS26 Int. Battery, Hybrid and Fuel Cell Electric Vehicle Symposium, 2012. A. Delorme, D. Karbowski, R. Vijayagopal, A. Rousseau, and S. C. Ave, “Fuel Consumption Potential of Medium- and Heavy-Duty Applications,” in Proc. of the 25th World Battery, Hybrid and Fuel Cell Electric Vehicle Symposium & Exhibition, 2010. M. Khodabakhshian, L. Feng, and J. Wikander, “Improvement of Fuel Efficiency and Drivability Using Simple Prediction for Gear Changing,” in Advances in Automotive Control, pp. 518-523, 2013.